For this week I decided to write about Brigid since she is patron to both Heather and I. Also her holiday on the Celtic wheel of the year, Imbolc, is just around the corner. 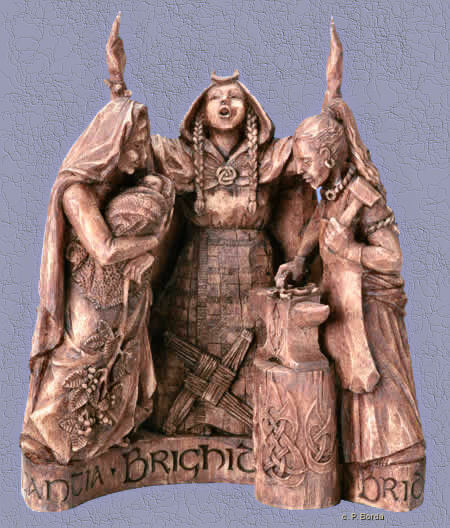 Brigid (also spelled Brighid, Brighde, Bride, Breo-Saighead, Brigantia) is a Celtic triple goddess whose responsibilities include poetry, healing, and smith's work. She is also associated with fire and knowledge. A sacred flame was kept at Kildare for her even into Christian times when nuns tended the flame. It is because of this association with fire that she is also considered a hearth goddess. Brigid is also a goddess of magick. Words have power. As a goddess of poetry, the power of the word, spoken or sung, falls under her domain. The bards frequently called upon her as a patron of inspiration. My workings with Brigid go back to before she became my patron. My wife was having health problems so during a healing ceremony for her I journeyed to Brigid to ask for healing. I chose Brigid because of her association with healing and because she is Heathers patron. During the journey she taught me a new healing technique. I believe that at that time she had already decided to become my patron, it just took me a few months longer to figure it out. I journeyed to the Goddess to officially petition her to become my patron, and I have been working with her ever since. A note: Many of my posts will reference journeying. This is a shamanic technique that I practice on a regular basis. For those who do not know what a shamanic journey is, it is similar to astral projection, OBE, and lucid dreaming. I will go into more detail about journeying when we reach the "J" weeks. I love that we share a Patron Goddess and God. Brighid was perfect to call upon for her blessings on you and your family. Her hearth fire is always welcome to those who seek her with pure intent which is what you did. Thank you for your post about Brighid. Thank you for sharing your journey with Brigid; I'm just beginning mine, and appreciate the perspective.